Follow the romantic Rhine River on its winding journey from the Swiss Alps to the Netherlands, aboard a 7-night cruise... You’ll experience medieval winetowns, cathedrals, castles, museums, and river landscapes of the kind that inspired JMW Turner and Richard Wagner. 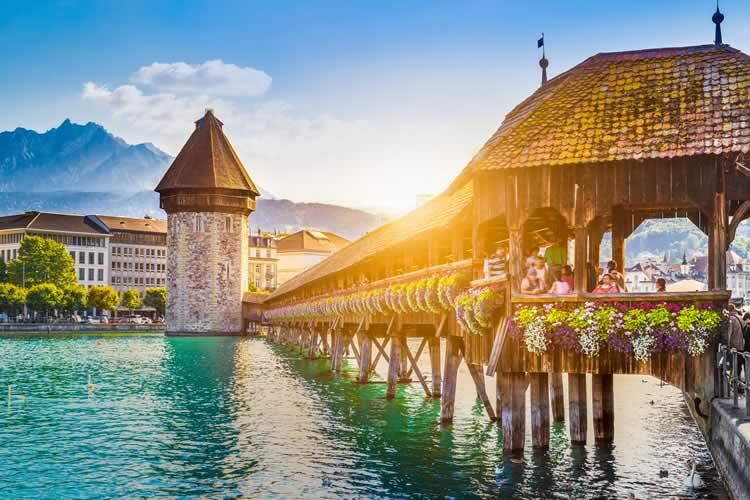 Begin with a two-night stay at a luxury hotel in Bern, with an idyll in Lucerne; then sail from Basel with visits to Colmar, Stuttgart, Rudesheim and Cologne... a Tauck Exclusive evening of dinner and music at Schloss Ehreshoven... a visit to the windmills of Kinderdyke, and two nights in Amsterdam with a tour along the city’s canals. A transfer is included from Zurich Airport or the train station (Zürich Hauptbahnhof) to the Bellevue Palace Bern in Bern, the capital of Switzerland, which is surrounded by the Aare River and distant Alpine peaks. Your two-night stay is at an historic luxury hotel favoured by celebrities and heads of state, and featured in master spy novelist John LeCarré’s spy novels. Join us this evening for a welcome reception and dinner. You have a choice of sightseeing adventures today. Head for the snow-capped mountains on a full-day’s excursion to Jungfraujoch, known as the "Top of Europe." Drive to the village of Lauterbrunnen for a train ride to Kleine Scheidegg, then board a cogwheel train for the scenic climb to Jungfraujoch, highest railway station in Europe; here you’ll find a restaurant, observatory, research station, a gallery of ice sculpture, and breathtaking views of the glacier-clad Bernese Alps. Alternatively, explore the eclectic charms of Bern on a walking tour, followed by time on your own. Medieval and modern mix artfully in an unhurried atmosphere where sights include open-air markets and cozy underground bars, the Parliament Building, the Gothic cathedral, a bear park (in honour of the town’s symbol and mascot), a house where Einstein lived and wrote his "Theory of Relativity," and the Zytglogge, a 16th-century astronomical clock featuring animated figures. Spend the evening as you please; the vibrant nightlife includes trendy clubs and restaurants, and a grand casino. Leave Bern this morning and arrive in Lucerne, nestled beside a stunning blue lake in the Alpine foothills. Features of Lucerne’s medieval old town (picturesque market squares, burghers’ houses, spired churches, and restored ramparts) unfold on a walking tour which includes the 14th-century Chapel Bridge, the oldest wooden covered bridge in Europe, and the Lion Monument, an eloquent memorial to Swiss soldiers who died in the French Revolution. Enjoy lunch on your own, then travel to Basel, where you’ll board your riverboat. Join us for a welcome reception as you sail for Breisach, Germany. Dock in Breisach, then drive to the village of Colmar, France, in Alsatian wine country. The principal industry in Colmar is food and wine, but its irresistible charm lies in its beautifully preserved medieval architecture that conjures an idyllic place out of time: colourful half-timbered houses and gardens, rambling cobbled streets, arches and alleys, sculpted fountains, and canals that wind through a corner of town called Little Venice. Aside from its winemaking heritage, Colmar is known as the hometown of Auguste Bartholdi, the sculptor who created the Statue of Liberty. A walking tour includes a visit to the Unterlinden Museum, housed in a Gothic convent, whose impressive collection includes Mathias Grünewald’s famous Isenheim Altarpiece, paintings, engravings and sculpture from medieval to modern (including works by Dürer and Holbein, Picasso and Léger), and a wealth of archaeological artefacts; join us for a private reception in the museum, a Tauck Exclusive! Sample the art of Alsatian cuisine at lunch on your own, then return to the riverboat for a sail through the Upper Rhine Plain. Join us for a cocktail reception that is followed by dinner. Arrive in Karlsruhe this morning, where you'll have the choice of staying in town for a bicycling excursion, or departing by coach for a visit to Stuttgart, the cradle of the automobile and the hometown of Porsche and Mercedes-Benz. Despite its reputation as an industrial powerhouse, Stuttgart offers a charming, small-town atmosphere, tucked in a valley between vineyards and forests, and an inviting urban landscape of historic sites, lakes, parks, and gardens. After a walking tour and lunch, you have a choice of touring the Porsche Museum – a dazzling ultramodern showcase featuring 80 cars, from the earliest models to the present (including concept cars and prototypes), in exhibits that trace the history of the legendary car company – or spending free time in the city center, exploring its magnificent architecture (neo-classical palaces, restored castles, gracious public squares and baroque fountains) as well as shops, galleries, cafes and wine taverns. Return to the ship for dinner this evening, followed by musical entertainment onboard. Near the foot of the Neiderwald, surrounded by vineyards, the ruins of Ehrenfels Castle watch over the Rhine Gorge; just around the bend, you’ll dock in the winemaking town of Rüdesheim, under the lofty gaze of the famous Neiderwald Monument. The 1000-year-old town charms with its cobblestone streets of storybook houses, cafes and wine taverns; among its must-see attractions is Siegfried’s Mechanischem Musikkabinett, a museum dedicated to antique self-playing musical instruments. Siegfried’s mesmerizing collection includes orchestrations, musical clocks, player pianos, fairground organs, self-playing violinas, and the world’s largest automated doll orchestra. Stop in for refreshments at Rudesheimer Schloss, an historic hotel and restaurant. Then return to the riverboat for a cruise on the romantic Middle Rhine. Sentinel castles, steep sloping vineyards and towering precipices like the Lorelei Rock wind past with commentary by your Tauck Director. Land at Linz am Rhein, then drive to Engelskirchen for a visit to its neighboring castle, Schloss Ehreshoven. Built in the 14th Century and later expanded in the style of a grand Baroque manor house, the estate is surrounded by a moat, landscaped gardens, and a castle park. Schloss Ehreshoven is frequently used as a film location but this evening it’s the elegant setting for a Tauck Exclusive cocktail reception and dinner with entertainment. Tonight, sail for Bonn, where you’ll dock overnight. Depart Bonn this morning for a short cruise to Köln (Cologne). One of Germany’s oldest cities (founded in the 1st Century AD), Köln was once a Roman provincial capital, and later a fabulously wealthy medieval trading port; the city was almost totally destroyed during World War II, but many of its architectural treasures have been restored, including the towering Cologne Cathedral, a twin-spired masterpiece of High Gothic architecture. Return to the ship for lunch. This afternoon, you’ll cruise the lowlands of the Rhine (with commentary) en route to Dordrecht in the Netherlands. Begin the day with a guided walking tour of Dordrecht, a wealthy trading port in the Middle Ages, now a treasure trove of medieval and baroque architecture and canals, and literally hundreds of historical sites and monuments; conspicuous among them are the towering 13th century Grote Kerk (Great Church), and the city’s only surviving windmill, built in 1612. Insights into windmills and their ubiquitous role in Dutch life await you on a visit to the village of Kinderdyke (Child’s Dyke) where the flat landscape, crisscrossed with canals, presents the largest concentration of windmills in the country. The 19 windmills, most of them built in the 18th century, are national monuments; for centuries, their massive wind-driven mechanisms have been used to pump water out of the polder and into reservoirs and canals, reclaiming land from the river. Such ingenious methods of water management have enabled a country that is almost fifty percent below sea level to exist at all, lending weight to the local saying, “God created the Earth, but the Dutch created Holland.” Return to the riverboat for lunch, then enjoy free time to explore the charming cobbled streets of Dordrecht, rich with historic sites, antique shops, and art galleries. Dine aboard ship this evening. Arrive in Amsterdam this morning and embark on an orientation tour. Amsterdam is often called the Venice of the North for its elaborate network of canals that wind through a romantic historic center of cobbled streets and stunningly well-preserved Dutch Renaissance architecture. Board a canal boat for a tour of the city from the inside (the best way to see it) along 17th century waterways lined with trees, gabled merchant houses, and vibrant urban life. Your tour includes a visit to the Rjiksmuseum, home to masterpieces of the Dutch Golden Age, including Rembrandt’s Night Watch. You’ll have time to explore the city on your own; Amsterdam’s compact urban landscape is made for exploring, brimming with art museums, coffeehouses, and eclectic architecture. Aboard ship this evening, enjoy a delightful choral performance before joining the crew for a farewell reception and dinner. Your Rhine river cruise ends: Amsterdam. Fly home anytime; a transfer from your riverboat to Amsterdam’s Schiphol Airport or Central Train Station is included. Allow a minimum of three hours for flight check-in at the airport. All private Tauck shore excursions – £2030 Value!